How much electrical power data centers use, and how it’s generated – has attracted much scrutiny in recent years, and for good reason. The population of data centers continues to grow in response to fast growing demand for digital data and content. Typically portraying themselves as taking the ethical ¨high road,¨ leading data center operators – Amazon, Apple, Google, Facebook, Microsoft etc. – are grossly underestimating how much coal-fired electricity they’re using, and thus are responsible for much more in the way of carbon and greenhouse gas (GHG) emissions, according to a new study from Lux Research. These companies, moreover, have developed, and make use of, the most advanced and sophisticated real-time data monitoring and analysis tools and systems. Thing is they’re apparently not using them when it comes to tracking, analyzing and reporting on their own carbon and GHG emissions. 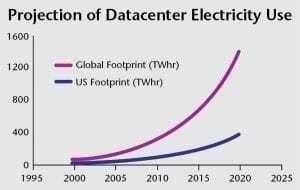 According to Lux Research, the “1,520 data centers in the U.S. consume 91 billion kilowatt-hours of electricity per year, and the National Resource Defense Council (NRDC) projects they’re on track to reach 140 billion kilowatt-hours by 2020.” That, Lux points out, is two years worth of power for all the households in New York City. Data center owner-operators, moreover, pay more than $10 billion for electricity a year, accounting for some 2.5 percent of overall electricity revenues nationwide. Pressure from environmental and public interest groups, Greenpeace prominent among them, has prodded executives of Silicon Valley’s leading high-tech companies to live up to their oft-touted ethical standards by making greater use of zero- or low-emissions energy sources, as well as openly and regularly disclosing data regarding power usage, sources and carbon footprints. Instead, they’re using the EPA’s Emissions & Generation Resource Integrated Database (eGRID), according to Lux, pointing out that eGrid lacks the granularity, or resolution, needed to accurately determine emissions at specific sites. EGRID divides the U.S. into 24 broad regions. Moreover, data is updated infrequently: the last available data set dates back to 2012. Lux Research used a new analytic tool developed in-house to determine emissions data center owner-operators produce as a result of purchasing grid power and compared them with those reported by companies themselves. The research team found that that data centers are typically making much greater use of grid power produced by coal-fired power plants, and are thus producing much more in the way of carbon and GHG emissions than thought. In contrast to the EPA’s eGRID, Lux Grid Network Analysis (GNA) divides the U.S. power grid into 134 regions, and makes use of U.S. Energy Information Administration (EIA) data that’s updated monthly. According to the Lux GNA for data centers, Google is underestimating coal-fired grid power used in 4 of 7 data centers, particularly at its data center in Berkeley County, S.C. Hence, Google is underestimating emissions by 42,000 MT CO2e per year, the equivalent of 8,500 SUVs on the road. Amazon, in turn, about 43 percent of grid power used at its 23 cloud services data centers in Virginia comes from coal. That’s compared to 35 percent using eGRID. The difference amounts to 85,000 MT CO2e per year, the emissions produced by some 5,000 households. Lux’s new grid power use analytical tool improved the accuracy of carbon reporting for data centers by a factor of 80, VP of Analytics and Lux’s energy benchmarking team leader highlighted. Assuming that holds true, widespread adoption among the largest power consumers would greatly enhance the quality of power and emissions monitoring and reporting. Lux has published a complimentary white paper on the topic. ¨Coal Computing: How Companies Misunderstood Their Dirty Data Centers¨ is available on Lux’s website with registration.